Dry. Open places. Full sun. 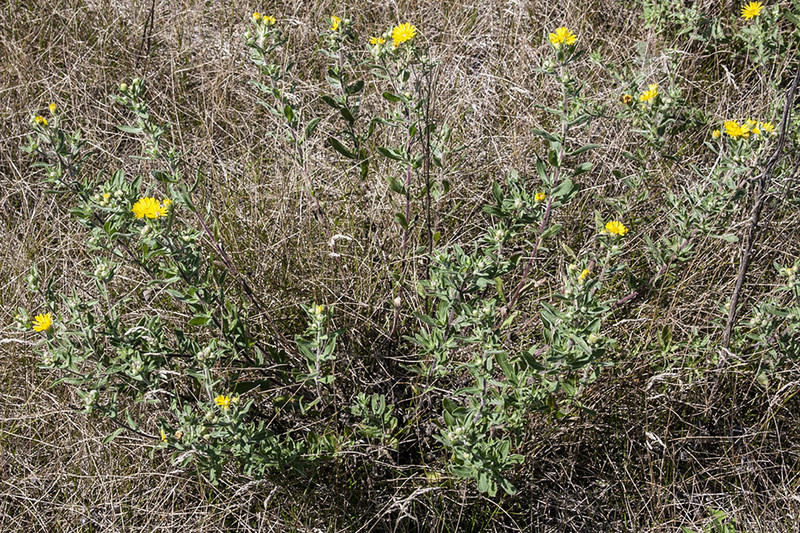 This is a 6″ to 16″ tall, erect, perennial forb that rises on 1 to 50 or more stems from a long, deeply penetrating taproot. The stems range from erect to reclining on the ground with just the tips ascending. They are sometimes reddish-brown and sometimes whitish near the top. They have at least 2, sometimes 3, types of hairs. They are moderately to densely covered with straight, stiff, sharp, appressed hairs. They also have sparse to abundant long, coarse, stiff, spreading hairs. They are sometimes also sparsely covered with gland-tipped hairs. There are no basal leaves. Stem leaves are alternate and are not crowded. Lower stem leaves are inversely lance-shaped, ⅞″ to 1½″ long, and ⅛″ to 5 ⁄16″ wide. They are attached to the stem on short leaf stalks. The leaf blades are narrowly wedge-shaped at the base and angled at the tip, the angle less than 90°. There is sometimes a short, sharp, abrupt point at the tip. The upper and lower surfaces are rough to the touch due to a moderate covering of straight, stiff, sharp, appressed hairs. The surfaces may also be sparsely to densely covered with gland-tipped hairs. The margins are untoothed and flat, not wavy. There are straight, stiff, sharp, appressed hairs along the entire margin and sparse to abundant long, coarse, stiff, spreading hairs near the base. Lower stem leaves are usually absent at flowering time. Upper stem leaves are similar in size and shape, 13 ⁄16″ to 1⅜″ long, and ⅛″ to ¼″ wide. The inflorescence is a cluster of usually 1 to 12, sometimes as many as 25, flower heads at the end of each stem. The flower heads are 1¾″ to 1½″ wide. They are on ½″ to 2″ long or longer stalks that are sparsely to densely hairy and sometimes also sparsely glandular hairy. The flower heads are rarely subtended by bracts. When they are, those bracts are linear inversely lance-shaped, are greatly reduced in size, and are leaf-like. The whorl of bracts at the base of the flower head (involucre) is narrowly cylinder-shaped to bell-shaped and ¼″ to ⅜″ wide. There may be 10 to 38 yellow ray florets, though usually there are no more than 27. The strap-like portion of the ray floret is usually 5 ⁄16″ to ⅝″ long. There are 10 to 85, usually 20 to 50, yellow disk florets. The fruit is a 1 ⁄16″ to ⅛″ long achene with 30 to 45 off-white bristles attached to the end. The achene is inversely cone-shaped, with the attachment at the narrow end, and has 4 to 10 ribs. 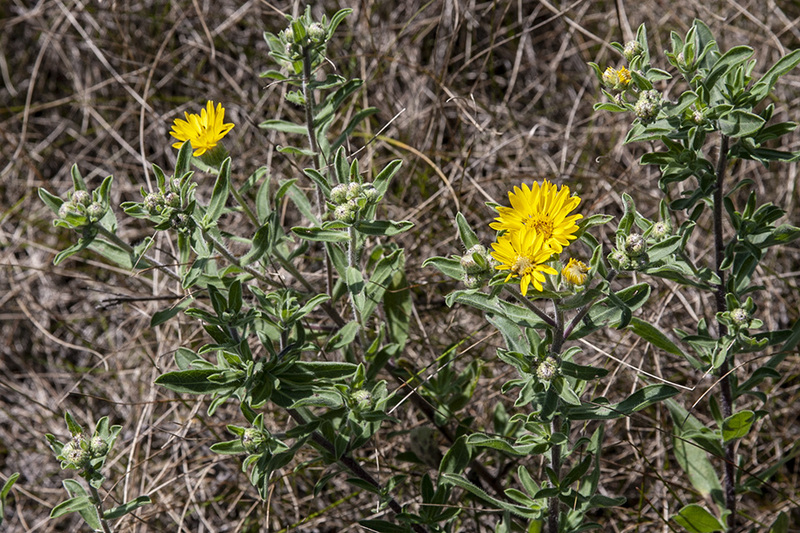 Hairy false goldenaster (Heterotheca villosa var. 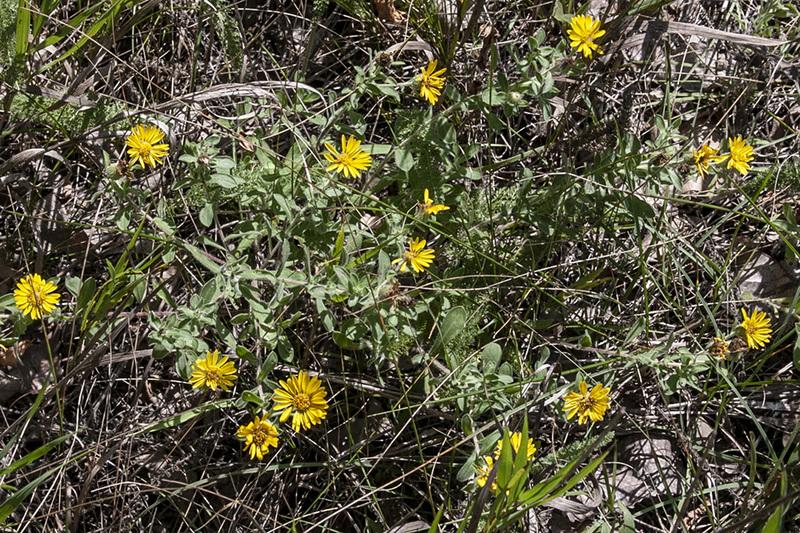 ballardii) stems and leaves do not have gland-tipped hairs. The bracts are often long enough to extend beyond the involucre. 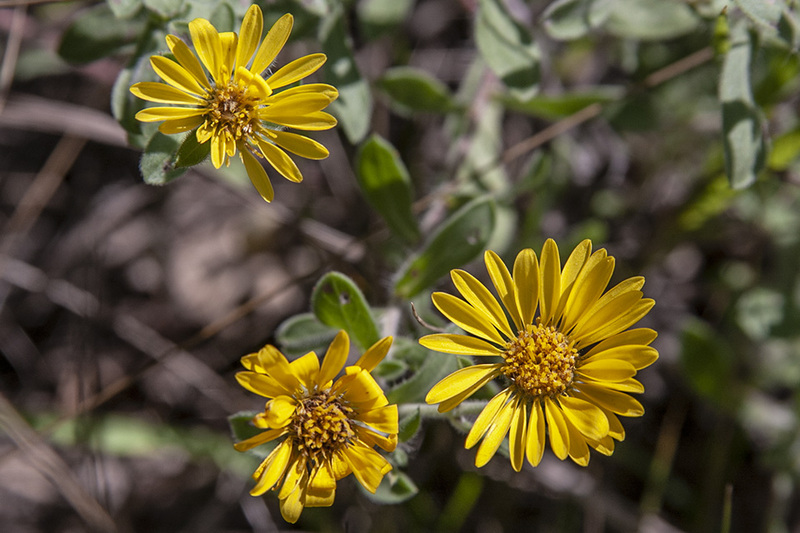 Hairy false goldenaster (Heterotheca villosa var. foliosa) upper leaves are oblong. The upper and lower leaf surfaces are moderately to densely hairy, the hairs often dense enough to completely obscure the leaf surface. The flower heads are subtended by 1 to 7 or more inversely lance-shaped, leaf-like bracts. The bracts are often long enough to extend beyond the head. 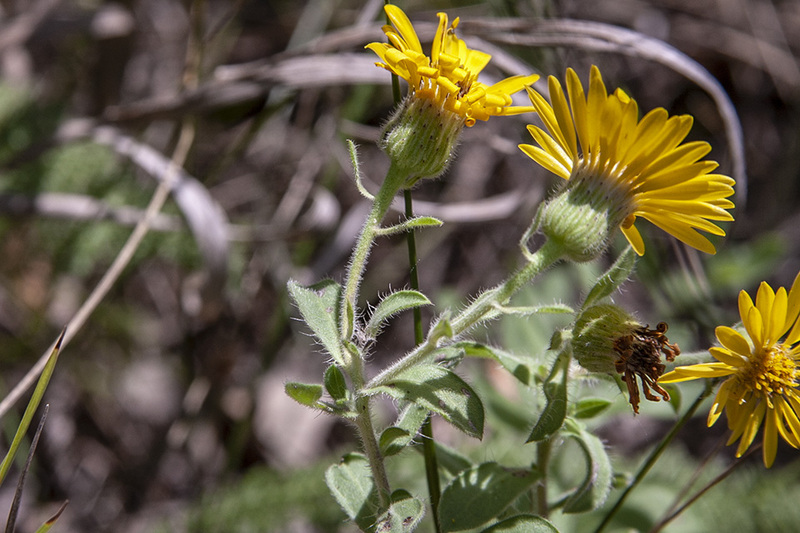 Hairy false goldenaster (Heterotheca villosa var. minor) upper leaves are narrowly to broadly inversely lance-shaped or oblong. The upper and lower leaf surfaces are sparsely to moderately covered with gland-tipped hairs. Stiffleaf false golden aster (Heterotheca stenophylla var. angustifolia) leaves are densely crowded and are pale green to grayish-green. The flower heads are subtended by 1 to 3 leaf-like bracts. The flower head stalks are no more than ⅝″ long.